1 GENERAL BIOETHICS COMMISSION BIOETHICS FORMATION FRAMEWORK GENERAL OBJECTIVE HOSPITALLER ORDER OF ST JOHN OF GOD To provide a framework to help the Provinces and the Centres of the Order to design their own activities to embark on a broader Bioethics formation process for the Brothers and the Co-workers of the Hospitaller Order of St John of God throughout the world. EXTENDED OBJECTIVES AND RATIONALE One of the strategic objectives of Bioethics education is too appropriately address the ethical aspects of clinical practice. To do this it is necessary, firstly, to learn to identify the ethical aspects as they arise in clinical practice, and then to identify the values underlying latent conflicts in order, in each instance, to choose the ethically justifiable courses of action, and lastly to acquire the skills required to put these courses of action into practice. The purpose of Bioethics education is to improve health care and patient care by providing more humane assistance, taking a positive attitude to the patients, with less paternalism in relations between the carer and the patient, and a higher quality of clinical decision-making. For this purpose it is essential to develop analytical skills and moral reasoning capabilities, and to acquire essential ethical knowledge, showing tolerance towards other people's positions. Bioethics must be one of the keystones of the curricula in the Order so that the Brothers and the Co-workers in the biomedical professions become guarantors to ensure that science and technology is handled purposefully for the benefit of people, and for their dignity. Educating means shaping human awareness. Bioethics education and therefore affects the individual's character through knowledge, by providing tools to perform intellectual exercises which develop the ability to assess human behaviour in the field of the biological sciences and health care, based on an ethical analysis, shaped by personal values and moral principles. While, in the field of health care, Bioethics is the practice of ethics and ethics is the philosophy of moral conduct, the teaching of Bioethics must be directed, firstly, to inculcating the need to comply with one's professional obligations within the context of a human relationship based on respect for the dignity of others and, secondly to resolving particular situations in which an ethical dilemma is the crucial problem to be resolved. The teaching of Bioethics must therefore not a seen as an isolated subject in the syllabus reserved for only a few people, but must be a cross-cutting subject for every member of the Order, whether Brother or Co-worker, and be based on a general policy of the Order, and be implemented at different levels which will identify the formation/training needs depending upon exposure to conflicting decisions, to enable officials to develop a critical power of analysis; this is why a framework model is needed, to identify and apply the subjects taught specifically for a given level, and lastly to be able to evaluate the skills acquired. This is the only way to guarantee a dynamic and universally applicable process. 2 GENERAL BIOETHICS COMMISSION BIOETHICS FORMATION FRAMEWORK MATERIALS AND METHODS HOSPITALLER ORDER OF ST JOHN OF GOD 1. IDENTIFICATION OF THE FORMATION LEVEL REQUIRED (APPLYING THE SUPPLEMENTARY CLASSIFICATION TOOL). 2. JOINTLY WITH THE CO-WORKER/BROTHER DEVELOPING THE TEACHING MODULES CORRESPONDING TO THE REQUIRED FORMATION LEVEL (THE MODULES WILL BE BASED ON A SYSTEM OF OCCUPATIONAL SKILLS). 3. ASSESSMENT OF THE CO-WORKER/BROTHER (TO BE PERFORMED BY THE LOCAL BIOETHICS COMMITTEE OR IF ONE DOES NOT EXIST BY THE INSTITUTION'S SCIENTIFIC DIRECTORATE. DESCRIPTION OF THE PROCESS 1. 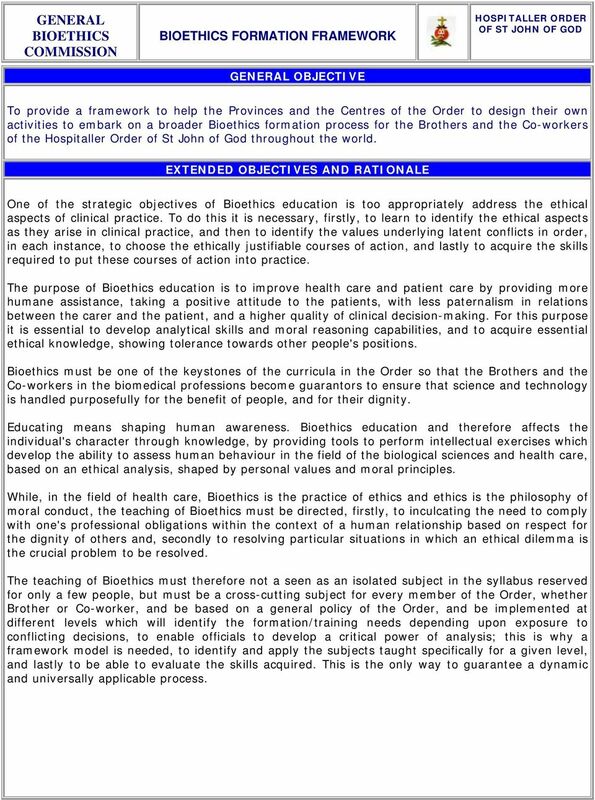 The General Bioethics Commission encourages and animates all the Order's Provinces and Centres to promote the Bioethics Formation for all the Brothers and Co-workers, and is offering this instrument as a guide and tool for this purpose. 2. Each Province and Centre must designate an official, and if possible a team, responsible for Ethical and Bioethical Formation, to design a Formation Plan for all the Brothers and Co-workers using this instrument that we are offering and any others that they deem appropriate. 3. 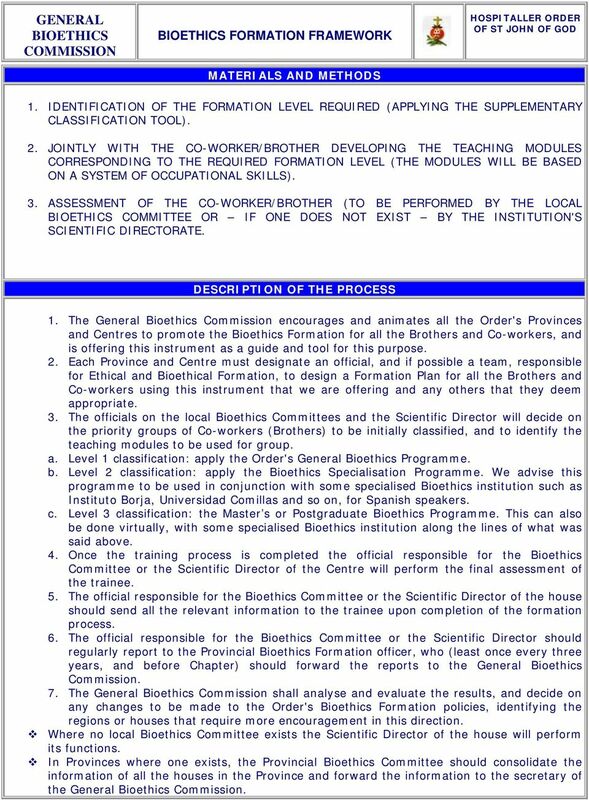 The officials on the local Bioethics Committees and the Scientific Director will decide on the priority groups of Co-workers (Brothers) to be initially classified, and to identify the teaching modules to be used for group. a. 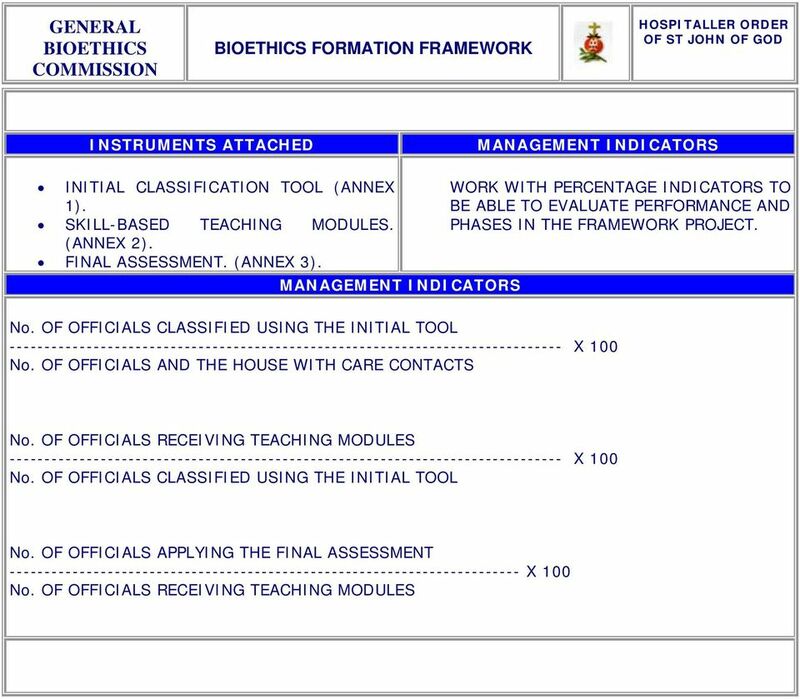 Level 1 classification: apply the Order's General Bioethics Programme. b. 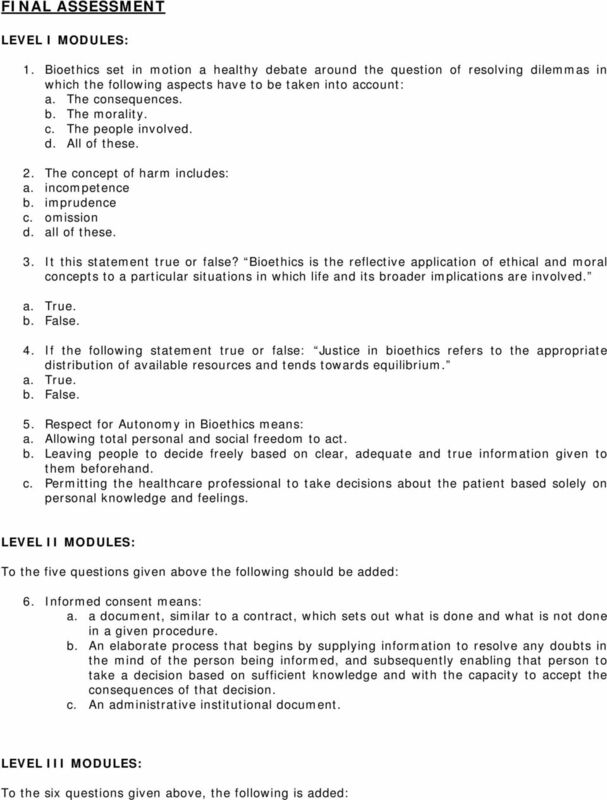 Level 2 classification: apply the Bioethics Specialisation Programme. We advise this programme to be used in conjunction with some specialised Bioethics institution such as Instituto Borja, Universidad Comillas and so on, for Spanish speakers. c. Level 3 classification: the Master s or Postgraduate Bioethics Programme. This can also be done virtually, with some specialised Bioethics institution along the lines of what was said above. 4. Once the training process is completed the official responsible for the Bioethics Committee or the Scientific Director of the Centre will perform the final assessment of the trainee. 5. The official responsible for the Bioethics Committee or the Scientific Director of the house should send all the relevant information to the trainee upon completion of the formation process. 6. The official responsible for the Bioethics Committee or the Scientific Director should regularly report to the Provincial Bioethics Formation officer, who (least once every three years, and before Chapter) should forward the reports to the General Bioethics Commission. 7. The General Bioethics Commission shall analyse and evaluate the results, and decide on any changes to be made to the Order's Bioethics Formation policies, identifying the regions or houses that require more encouragement in this direction. Where no local Bioethics Committee exists the Scientific Director of the house will perform its functions. In Provinces where one exists, the Provincial Bioethics Committee should consolidate the information of all the houses in the Province and forward the information to the secretary of the General Bioethics Commission. 4 ANNEX No.1. INITIAL CLASSIFICATION TOOL CLASSIFICATION LEVEL LEVEL I LEVEL II LEVEL III CO-OPERATING PERSONNEL BROTHERS THE COMMUNITY (OH), NURSING AUXILIARIES, ADMINISTRATIVE AUXILIARIES, PROFESSIONAL NURSES, PHYSICIANS, CLIENT CARE SERVICES, INTERNAL AUDIT GROUP, QUALITY ASSURANCE GROUPS DIRECTORATES (SCIENTIFIC, MEDICAL, MANAGEMENT, HUMAN RESOURCES...), LEGAL ADVISERS, COMMUNITY SUPERIORS (OH). BIOETHICS COMMITTEE MEMBERS LOCAL BIOETHICS OFFICERS. IF POSSIBLE BIOETHICS COMMITTEE MEMBERS ANNEX No. 2. 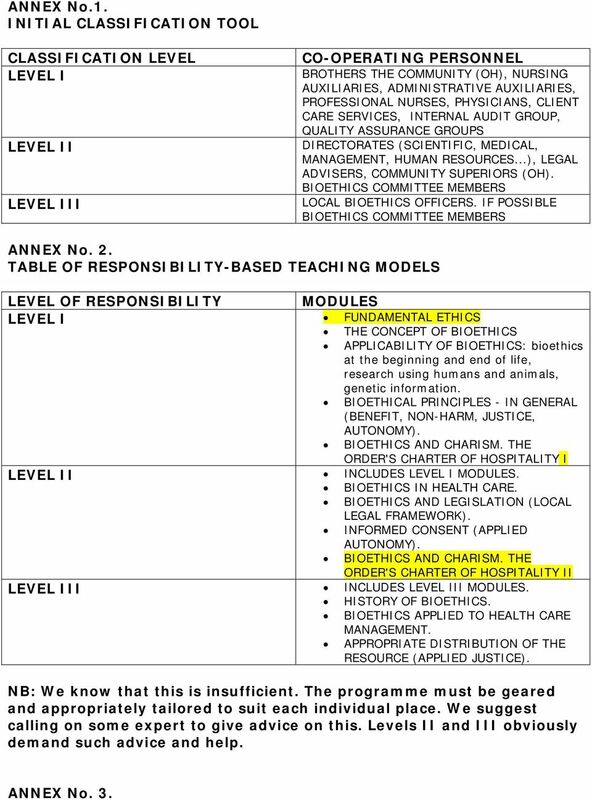 TABLE OF RESPONSIBILITY-BASED TEACHING MODELS LEVEL OF RESPONSIBILITY MODULES LEVEL I FUNDAMENTAL ETHICS THE CONCEPT OF BIOETHICS APPLICABILITY OF BIOETHICS: bioethics at the beginning and end of life, research using humans and animals, genetic information. BIOETHICAL PRINCIPLES - IN GENERAL (BENEFIT, NON-HARM, JUSTICE, AUTONOMY). BIOETHICS AND CHARISM. THE ORDER'S CHARTER OF HOSPITALITY I LEVEL II INCLUDES LEVEL I MODULES. BIOETHICS IN HEALTH CARE. BIOETHICS AND LEGISLATION (LOCAL LEGAL FRAMEWORK). INFORMED CONSENT (APPLIED AUTONOMY). BIOETHICS AND CHARISM. THE ORDER'S CHARTER OF HOSPITALITY II LEVEL III INCLUDES LEVEL III MODULES. HISTORY OF BIOETHICS. BIOETHICS APPLIED TO HEALTH CARE MANAGEMENT. APPROPRIATE DISTRIBUTION OF THE RESOURCE (APPLIED JUSTICE). NB: We know that this is insufficient. The programme must be geared and appropriately tailored to suit each individual place. We suggest calling on some expert to give advice on this. Levels II and III obviously demand such advice and help. ANNEX No. 3. 6 7. 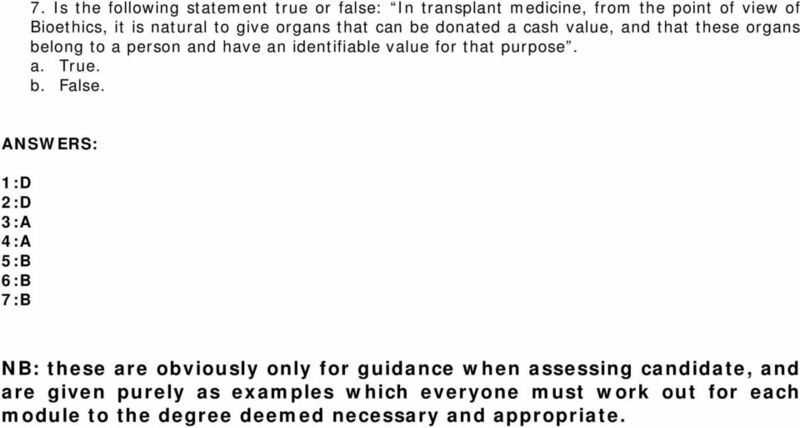 Is the following statement true or false: In transplant medicine, from the point of view of Bioethics, it is natural to give organs that can be donated a cash value, and that these organs belong to a person and have an identifiable value for that purpose. a. True. b. False. ANSWERS: 1:D 2:D 3:A 4:A 5:B 6:B 7:B NB: these are obviously only for guidance when assessing candidate, and are given purely as examples which everyone must work out for each module to the degree deemed necessary and appropriate. // CODE OF ETHICS FOR DENTISTS IN THE EUROPEAN UNION Adopted unanimously by the CED General Meeting on 30 November 2007, amending earlier versions of the CED Code of Ethics from 1965, 1982, 1998 and 2002.